Imagine working in an office building with daylight and open atriums that connect to outdoor garden space. Vancouver-based architecture firm Henriquez Partners Architects was hired to design the greenest office building in the city for the Canadian telecommunications company TELUS, and with this opportunity they re-envisioned what an office building could look like, with beautiful results. Last year, the project was completed, and now photographs have finally become available of the nine-floor headquarters located inside the TELUS Garden development in the heart of Vancouver. The one-million-square-foot TELUS Garden is a mixed use development that consumes an entire city block in downtown Vancouver, British Columbia, and this building is green as it gets. The complex comprises a 53-floor residential tower and a 24-floor office tower, which includes the nine floors that hold the company’s national headquarters. Construction was completed in 2015, and the headquarters are targeting LEED Platinum certification, with many sustainability goals tied to the base building systems. 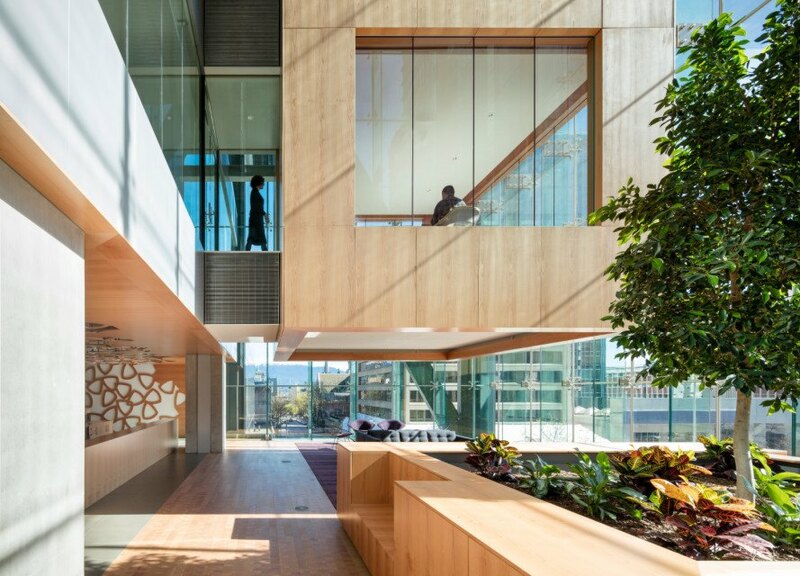 The TELUS Garden building employs passive ventilation, copious daylighting, radiant heating and cooling, integration of indoor and outdoor space, and the extensive use of local wood throughout. While Henriquez Partners Architects were the project architect for this eco-friendly, soon-to-be LEED platinum office building, OMB Architects (Office of Mcfarlane Biggar designers + architects) were hired as the interior architects on the project. OMB Architects approached their design with a goal to match the sustainability of the LEED platinum structure throughout the interior details. For interior architecture, OMB chose local woods, such as Red Alder, all non-toxic surface materials, and low-VOC and recycled materials throughout the project. 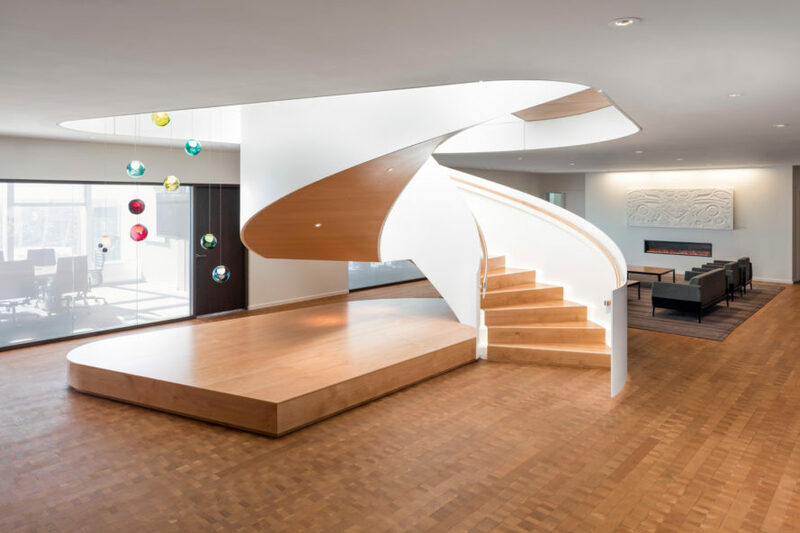 The local BC Red Alder wood was used throughout the office and meeting spaces, featured in the flooring as well as the sweeping spiral staircase. The TELUS headquarters also incorporates exterior space into the work environment, in the form of a terrace with solar cell-clad shades, a quiet garden space, and sweeping views of the cityscape. Imagine working in an office building with daylight and open atriums that connect to outdoor garden space. Vancouver-based architecture firm Henriquez Partners Architects was hired to design the greenest office building in Vancouver for the Canadian telecommunications company TELUS, and with this opportunity they re-envisioned what an office building could look like, with beautiful results. Last year, the project was completed, and now photographs have finally become available of the nine-floor headquarters located inside downtown Vancouver’s TELUS Garden development. Telus Garden Office Building in Vancouver, B.C. Among the green building components featured in the TELUS Garden hub is a raised access floor with a displacement ventilation system which uses 100-percent outside air, as well as radiant exposed concrete ceilings. 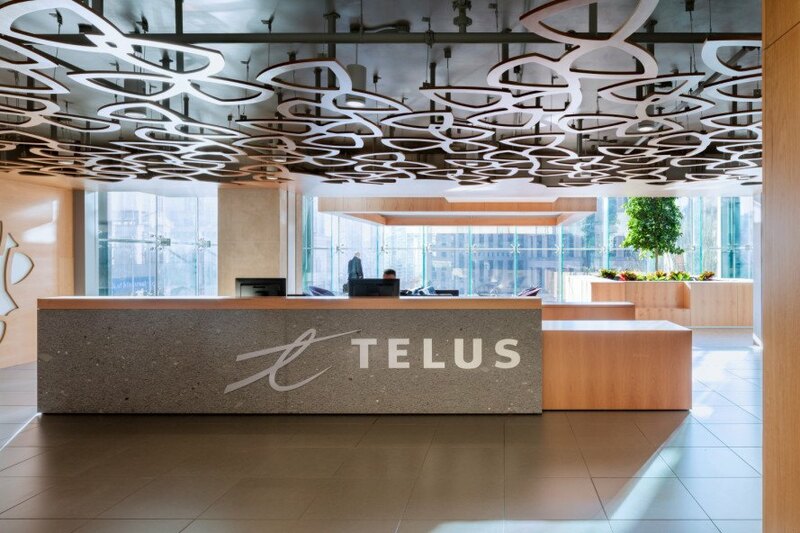 Vancouver-based architecture firm office of mcfarlane biggar designers + architects (omb) was hired to design the primary office space for the Canadian telecommunications company TELUS. Last year, the project was completed, and now photographs have finally become available of the nine-floor headquarters located inside downtown Vancouver’s TELUS Garden development. The LEED Platinum-targeted design puts to work a slew of sustainable elements, many of which are prominently featured in the building’s aesthetics. The one-million-square-foot TELUS Garden is a mixed use development that consumes an entire city block in downtown Vancouver, British Columbia. The complex comprises a 53-floor residential tower and a 24-floor office tower, which includes the nine floors that hold the company’s national headquarters. Construction was completed in 2015, and the headquarters are targeting LEED Platinum certification, with many sustainable goals tied to the base building systems. The building employs passive ventilation, radiant heating and cooling, and the extensive use of local wood throughout the interior space. Systems such as these actually informed the design of the building, as the concrete radiant ceiling had to be largely left exposed in order for the heating system to function properly and efficiently. The architects’ sustainable vision encompassed the building’s interior materials as well, calling for low-VOC and recycled materials throughout the project. The firm also insisted on utilizing locally sourced wood, and Red Alder was selected as a primary interior material. The sustainable wood was used throughout the office and meeting spaces, featured in the flooring as well as the sweeping spiral staircase. The TELUS Garden headquarters also incorporates some exterior space, in the form of a terrace with solar cell-clad shades, a quiet garden space, and sweeping views of the cityscape. Imagine working in an office building with daylight and open atriums that connect to outdoor garden space. Vancouver-based architecture firm office of mcfarlane biggar designers + architects (omb) was hired to design the primary office space for the Canadian telecommunications company TELUS, and with this opportunity they re-envisioned what office space could look like, with beautiful results. Last year, the project was completed, and now photographs have finally become available of the nine-floor headquarters located inside downtown Vancouver’s TELUS Garden development.